Frameless 90 degree corner enclosure. The final and finishing touch to your new, or newly remodeled oasis. Without question, the frameless line of shower doors and enclosures provides beauty, function and added value to your home. You might even say it will make a “statement” as the final touch to the most elaborate enclosures imaginable. We will work with you, your builder and designer or architect on design features, including hardware and glass option selections, proper construction preparation and the final installation schedule. 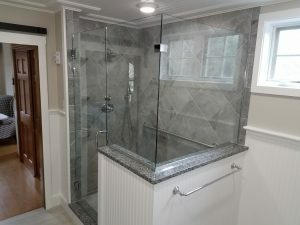 In addition to being a dealer for the top manufacturer’s in the business, we can also custom build your enclosure with our own signature line of frameless options using the finest hardware and glass options available. It is always best to include us very early in the construction phase for this level of enclosure so that we can provide you with optimum design and preparation details required to achieve the intended final result. An extensive array of frameless examples can be found in our Gallery.